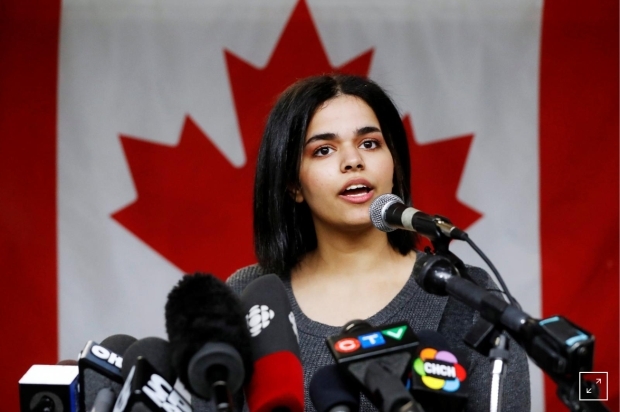 BCF : The saga of the 18-year-old Saudi girl, Rahaf Mohammed, has ended. She is now safe in Canada, where she was granted asylum. She had been on the run from her family who, she said, might well kill her. First, there is the demonstration that despite Qur’an 2:256, a favorite verse for Islamic apologists that says “there is no compulsion in religion,” the example of Rahaf Mohammed shows that there most certainly is “compulsion” in the religion of Islam. As for non-Muslims, it is true that People of the Book, ahl al-kitab — Jews, Christians, and Sabeans — are permitted to remain alive, and even to practice their religions, but they can do so only as “dhimmis,” tolerated as long as they fulfill a long list of onerous and humiliating conditions, of which the most important is the Jizyah tax. And that explains why millions of non-Muslims have, over the centuries, converted to Islam, because they knew it was the only way to escape from the conditions imposed on them as dhimmis. That need to escape dhimmi status constitutes another kind of “compulsion in religion.” 91% of the honor killings in the world are committed by Muslims. This is, according to the Wikipedia definition, the “murder of a member of a family, due to the perpetrators’ belief that the victim has brought shame or dishonor upon the family, or has violated the principles of a community or a religion. Linda Sarsour. Of course she does. But she has been mostly defensive about Saudi Arabia. She has repeatedly tweeted praise of the Kingdom, for example, of its offering 10 months paid maternity leave, as if that should end all criticism of the Saudi treatment of women. She attacks those who think Saudi women should be allowed to choose how to dress — i.e., whether to cover or not, and if so, by how much — by tweeting that it’s a trivial social problem. She’s defended Sharia law — ignoring its severe punishments, for example, for all kinds of sexual behavior, and its unequal treatment of women (e.g., in inheritance laws and testimony in court) — by exclaiming, again deflecting attention from the real issue, “wouldn’t it be great” if all interest payments were abolished as under Sharia. In reply to criticism of the condition of women in Saudi Arabia, she answers that “there are women in the Saudi parliament,” as if that were a suitable defense. You can find more on her defense of Saudi Arabia here. And what does Linda Sarsour say about those many Muslims, including Rahaf’s family, who think apostates from Islam should be killed? If she denounces that view, she would be denouncing a belief that is central to Islam.